This time around, Capcom’s Monster Hunter: World walked away with the show’s grand award while sixteen total games were honored during the event. Dragon Quest 11 releasing on PC was a major milestone for Japanese PC gaming, and a moment of symmetry: creator Yuji Horii was first inspired by computer games like Ultima and Wizardry, and now his series finally shares a platform with them, all these years later. It's the first, though he hopes it won't be the last. "If Dragon Quest 11 does sell on the PC, hopefully we can bring some of the older games in the series and port them to the PC," Horii said when we spoke in a recent interview. inXile Entertainment has released the first patch for The Bard’s Tale IV: Barrows Deep. According to the release notes, this patch fixes some crashes and addresses the loading times and framerate drop issues that have been reported by its fans. Furthermore, this patch adds a FOV slider to the options menu, adds the ability to delete each save independently, raises FPS cap on smoothing to 260, updates materials on some puzzle weapons handles not displaying properly on high, medium, low quality settings and more. Last edited by Couchpotato; September 23rd, 2018 at 06:32. Nice! Need to get back to Stellar Tactics! Thanks, Couch. During today’s livestream Beamdog CEO Trent Oster and Producer Luke Rideout shared the latest news on Neverwinter Nights: Enhanced Edition, the Infinity Engine Enhanced Editions, and the upcoming Edmonton Expo. They called Bernhard Stöckner (@niv), the Technical Director on the NWN:EE core team to talk about the game’s future development. The update accompanying the upcoming ‘Beasts & Exploration’ DLC will bring with it a host of minor additions and improvements. Each of these may not be big enough to warrant a blog post of its own, but together they make for a nice bouquet of things to look at. Let’s do so this week! Tuesday’s update includes two new game difficulty modes which add further replayability for existing players, and more options for those who haven’t yet sunk their teeth into this dark adventure through 1918 London. Paul Arendt, Failbetter's CEO and Art Director, will share a behind the scenes look at how Sunless Skies has evolved from Sunless Sea, including an advance peek at updates coming in October. Plus at least one surprise, and not the cannibal kind. This is a must-see for Failbetter fans. Disco Elysium EGX 2018 Panel. ZAUM Studio's Aleksander Rostov (Art Director) and Robert Kurvitz (Lead Designer & Writer) are joined by Alex Wiltshire (Acclaimed Video Games Journalist) to discuss the development of Disco Elysium, a groundbreaking blend of hardboiled cop show and isometric RPG. Starfield Teaser Trailer Analysis:What Does It Tell Us? Bethesda, one of the original “When it’s done” studios revealed officially what we’ve known for so long this past E3 when we saw the teaser for Starfield. The first new IP creation right out of Bethesda in nearly a quarter of a century is expected to take their fans to brave new frontiers beyond the furthest stars. While there’s a ton of potential for the game, it might as well be as out of reach as those same stars, since there’s nothing more for the game than the fact it exists and that there’s a brief, not even 30 second teaser for it. Now, a sub-30 second trailer is hardly much for an analysis, especially this long after every youtube creator with a pulse has tore it down frame by frame. I don’t intend to repeat them by suggesting that the planet is Earth. But even without more to go on, we can count on one thing to intuit some details about the game. Bethesda themselves! The house that Elder Scrolls built has more than a few elements which you could almost consider signatures, and elements from the trailer suggest a few ways in which Bethesda could be leaning on or breaking some of those. Any time I read Disco Elysium, I must think of the Crypt Of The NecroDancer. Dragon Quest XI Modders Fix the Game's "Worst' Feature"
Dragon Quest XI is a damn good video game. Along with dozens of other outlets, Twinfinite scored the game among our highest rated titles of the year, celebrating its gorgeous visuals, innovative turn-based battle system, and generally reveling in its charming world. But if there’s one aspect to the experience that has driven me absolutely insane over the course of my first twenty hours with the game, it’s that damn MIDI-soundtrack. Thanks to a new PC mod, though, my ears –and my sanity– might finally get some respite. Valkyria Chronicles is a game of rare personality, and this trait manifests most strongly through its characters. Individuals often take a backseat in the story of strategy games, which instead focus on intrigues and the struggle against the external threat, but Sega humanised war in a way that few developers had done before or have since. Today we deployed 3.4.3, which contained some large changes to how Sulphite is acquired and how Delves are costed. Our model (based on live gameplay data) showed that the changes in 3.4.3 would result in 25% more Delving for the average player who was playing at a given tier of maps. The place where this breaks down is for players whose map base is insufficient for the depth they are playing at. We were assuming that players were playing at approximately the equivalent depth in the mine that corresponded to the same difficulty in the atlas. Make of it what you will, but there's a rumor going around on the Codex that Larian has acquired the Baldur's Gate license. Anyway I usually don't believe rumor's but they sometimes come true. Two things I would hate if true is Baldur's Gate going turn-based combined with Larian's bad writing. Well three if you count how they like to inject humor in games. Anyway I doubt it will have anything to do with the old games as a lot has changed since 2nd Edition D&D. Last edited by Couchpotato; September 25th, 2018 at 03:05. Yeah, it's not really something that would interest me anyway as I'm not much of a Baldur's gate fan (though there are some things I like about those games). While I do greatly prefer tactical turn-based to RTwP combat, I don't like how Larian does it in D:OS with the elemental goo everywhere, nor do I care for their over the top silly humor. Still I guess if it turns to be true this might be exciting to people who are fans of both BG / Forgotten Realms and Larian. @daveyd the more I think it might be possible given that Swen's ultimate goal is to make an RPG that dwarfs everyone, and Baldur's Gate would be perfect for that. I believe a few Ex- BioWare veterans are now working for the studio also. The Codexians seem to be excited. They've pressed every one of the buttons on their button parade. Valkyria Chronicles 4 was released on Steam today. Happy launch day! 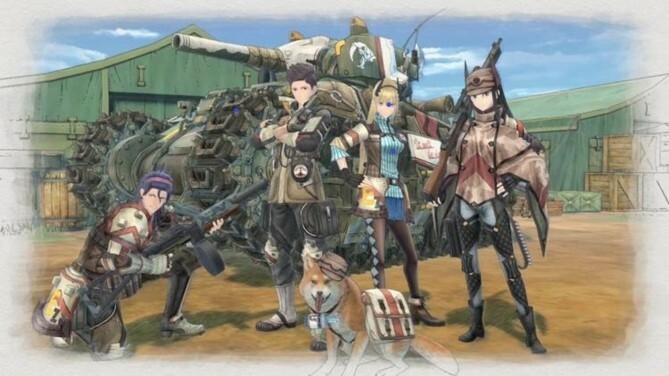 Valkyria Chronicles 4 is finally here! Thanks for the community support and to everyone who has waited so patiently for us to release on Steam. If you pre-ordered, your 'Captainless Squad' DLC will appear in your Steam library and download automatically. Take it to the enemy, soldiers! Pathfinder: Kingmaker was released on Steam. Would that conflict with beamdog ? I've also heard Beamdog no longer has the BG license. SEGA/ATLUS are at EGX presenting upcoming titles, including Fist of the North Star: Lost Paradise, the high-intensity action-adventure RPG based on the beloved manga, developed by the Ryu Ga Gotoku Studio behind the acclaimed Yakuza series. Also on show are EGX exclusive demos for Persona 3: Dancing In Moonlight & Persona 5: Dancing in Starlight, featuring new content for Persona and Rhythm game fans a-like! Jeff Spock, writer on the Endless series of strategy games for Amplitude, explains how to write for genre, and the difference between literary genre and game genre. How can narrative and theme shape level design? How can you avoid confusing players? A must-see for game writers of any experience. The much anticipated Homecoming revamp is soon to arrive, and with it — fundamental changes to the way we all play GWENT. This marks the next GWENT Masters tournament as truly special. Open #7 will be historic, but not only for that reason. For the first time ever in an official GWENT Masters tournament, we will see a female participant competing for the lion’s share of the $25,000 prize pool. Bioware has announced that Anthem has passed its Alpha milestone, meaning that every part of the game is in, and functioning. As such, the team will now move almost entirely to bug-fixing, testing, and tuning in order to polish its title and have it ready for its February 22nd release. The Council Episode 4: Burning Bridges was released on Steam. Hum. THat reminds me what happened to that game consortium ?? The council for some reason keeps reminding me of that game but it seemed to have mostly vanished from the news feeds. The first game Consortium was re-released called the Master Edition. The second Fig funded game called Consortium: The Tower is still in development. Latest update says Act 2 was finished. Seems development is going very slowly.